Well we finally made it to Beijing. It only took an abscessed tooth. I'd had one of Julie's teeth filled right before we left for China last August. I didn't choose a very good dentist and he didn't get all of the cavity gunk out before filling it, so her tooth continued to decay. This caused infection and an abscess. I wrote to friends back home who put me in contact with a dentist who suggested she have a pulpotomy performed (a baby tooth root canal). I'm a little leary of the dentists here in Jinzhou and got a referral to one in Beijing. We left last Sunday taking the train to the capital. My friends Nancy and Sarah accompanied us. We took the hard seat car, but this particular train had really nice hard seats. They were more like soft seats not the hard benches I'd seen before, so our journey was quite comfortable. When we first boarded the train in Jinzhou the conductor came up to Nancy and began speaking to her in Chinese. He was carrying a book that he wrote something in. This is something I'd never seen done before so after he left I asked Nancy what he'd done. It seems that he was "registering" us. Since I was a foreigner on the train we were considered VIP's and to be regarded as special guests. Hmmm well that was a new one for me. Of course I didn't notice any special treatment other that being registered. 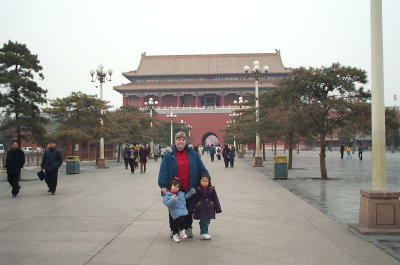 We got to Beijing at about 630 in the evening and went to the hotel. LIT has a special arrangement with a hotel in Beijing and we get a break on the room rate. Upon checking in they told me I was to be charged 210 yuan per night for my room. I told them that Leanne my Foreign Affairs Officer who'd made the reservations for me had told me the room rate was 170 yuan per night. They then explained that was the room rate for Chinese people. I was soooooo MAD. I'd heard of this before but had never experienced it. It doesn't cost the hotel any more for an American (or any other foreigner) to stay there rather than a Chinese citizen. I showed them my "green card" (my residence permit) and my Foreign Expert Certificate, but it didn't matter. Their policy was to charge foreigners more. My parting words to the desk clerk were "Nancy translate everything I say, (and she did), You are welcome to come to America (Nancy told her this and she smiled) and stay in a hotel (she smiled again) and we won't discriminate against you and charge you more just because you are Chinese." At this I walked off. Nancy told me she'd said "she's mad isn't she" duhhhh. I'd been told of another hotel at the teacher's college that only charged 80 yuan per night, but they only allowed teachers to stay there and would not allow my girls or Nancy and Sarah who are students to stay there. I checked with a friend in Beijing and she told me this was still a good price so we stayed there anyway. I saw no reason to "cut off my nose to spite my face" and pay more for a room at another hotel just to make a point. We got up the next morning and went to the dentist's office. I was pleasantly surprised at how "western" everything was. Everyone spoke excellent English and I had no problems communicating with the dentist or any of his assistants. I found out later the dentist we been referred to had gone to college and dental school in the States. Maryland to be exact. He was a really nice guy and very patient with Julie. Julie was a real trouper. I was amazed at how well she did. I just sat by her side, held her hand, and softly sang/hummed Jesus Loves the Little Children. The dentist, Dr. Lee began to hum along too. He filled her up with novacane and she never flinched. It was kind of neat to watch everything that was done. After he took the old filling out, you could see all the decay up there, it was gross but cool to see. He got rid of all of it, packed her tooth with some antibiotics, put in a temporary filling and we were done. Dr. Lee told me Julie was the best 4 year old he'd ever worked on. He then went on to say "never underestimate the power of prayer." After leaving the dentist's office we went to a big supermarket. We walked in and I saw a check out isle totally dedicated to people using foreign credit cards to pay for their purchases. After seeing this I grabbed a cart and proceeded to have a grand time. They had soooo many comfort items from home. I bought shortening (can you say apple pie), Heinz catsup, corn oil, Bisquick, black pepper, more pasta (my mom and aunt had sent us a bunch of cheese packages from Macaroni and Cheese mixes), Parmesan cheese and of course REAL COFFEE, not that Nescafe instant junk that is the only thing available in Jinzhou. You should have tried to lift my suitcase on our return trip. Shortening and corn oil weigh a ton. The cab driver asked if I had a rock in there or something. Sarah told him it was a brick from the Great Wall. After leaving the supermarket we headed back to the hotel and decided to go to the McDonalds for dinner. It was about 2 miles away, but was a pleasant walk. The next morning we hired a cab for the day and headed off to Mu Tien Yu to see the Great Wall. It took about an hour and a half to get there. It was really overcast and kind of foggy. I thought "oh great, we wont be able to see anything," but as we got there the clouds began to part and the sun came out. Like the dentist said, never underestimate the power of prayer. We took a cable car to the top of the mountain. It would have taken us...make that me, half a day to climb the mountain to the top to get on the wall. I've seen many pictures of the Great Wall and I'm here to tell you they don't even begin to capture the magnificence of it. When Clinton visited China he saw the Mu Tien Yu section of the Great Wall and all he could say was "amazing, just amazing" That pretty much sums it up. It's hard to believe it's over 5000 kilometers in length. There are many legends surrounding the construction of it. Most of them having to do with workers that were killed and the loved one's they left behind. Personally after seeing it, I can't even begin to imagine how it was constructed. Pictures don't even begin to show how steep the mountains are. 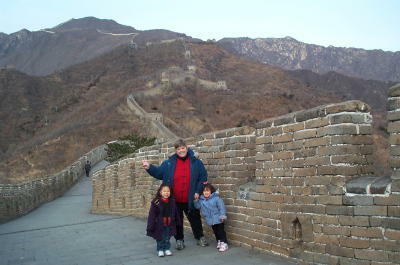 There are sheer cliffs and the Great Wall snakes it's way along the top of them. Seeing it has to be one of the high lights of our Chinese adventure. I had been told by several people here, don't visit the wall in winter. It's too cold and too windy. It was a perfect day. We wore coats, but would have been comfortable in a wind breaker and there was no wind to speak of either. Because it is winter nobody else was there....well very few anyway. We stayed on top for an hour or so and then decided to make our way down. Getting down the mountain in Mu Tian Yu is a blast! They have a really cool slide that takes you all the way to the bottom. When I was first told of the slide, I thought you slid on your duff and it probably went straight down. Wrong. 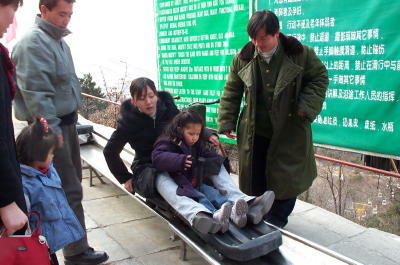 It was like a luge course and you rode on these sled things. It was too cool. When I saw it, I thought no way am I going down that, but I tried it. The sleds are on wheels and have great breaks and you can go slow if you want. The sled course snakes it way down and takes quite a while to reach the bottom. I went last and had to go slowly to keep from running over Sarah and Charlie. Nancy and Julie went first with Julie yelling "faster, faster" all the way down. It was great fun and well worth the 15 yuan price ($2.00) After we got to the bottom of the mountain the clouds rolled back in blocking the view. We then made our way back to Beijing, stopping at a little restaurant for a late lunch. Our cab for the day then took us to Tienamen Square where we spent the next few hours viewing the Forbidden City. I wasn't prepared for the vastness of the Forbidden City either. That place is huge. We didn't see anywhere near all of it. Everyone was tired so we had the cab driver take us back to the hotel around 600. We had a light supper and hit the sack. I think the girls were asleep even before their heads were on the pillow. We met up with Elaine on Wednesday. A mutual friend in Tulsa had introduced us last August. Elaine was home visiting her family and I hadn't left yet. Elaine met us at Starbucks for coffee and we then went to McDonalds (for the girls) and then hit the Silk Alley. The Silk Alley is really an overpriced tourist trap with lots of shopping. I was able to get a couple of things at good prices, but for the most part, things in Jinzhou are much cheaper. I priced some traditional Chinese children's clothing and found it was extremely overpriced. I inquired the price of kites and at first was quoted a price of 180 yuan. I just laughed. Nancy told me her room mate had gotten one last spring in Jinzhou for 25 yuan, but she wasn't sure if they'd have quite the selection back home. I did some serious bargaining and got them down to 55 yuan for 2 kites. Almost as good as Jinzhou, so I bought them. You really have to know the price of things here or you will definitely get ripped off. I remember Leanne telling me about purchasing tee shirts at the Great Wall for 25 yuan while a westerner was being charged 200 yuan. (I paid 20 yuan each for ours) One of my favorite lines to tell them is "I am laoshir (teacher), making Chinese wages, your prices are too high" This usually gets the price down quickly. If not I walk off (and they usually give chase) I've also become really good at haggling over a couple of yuan. Shoot it's fun. After leaving the Silk Alley we headed over to another Starbucks close to the dentist's office. I left Elaine with Charlie, Nancy and Sarah while Julie and I went to see Dr. Lee. He put in a permanent filling and we were done. We walked back to Starbucks and all headed to the Outback Steak House for dinner. Nancy and Sarah had me order for them. I got one a steak and the other some baby back ribs. Dinner came with your choice of soup or salad so I ordered one of each. The soup was onion soup which neither of them was very fond of and ordering them a Ceasar's Salad was an even bigger mistake. Way to much Parmesan cheese. The other soup choice was potato so they shared it while I inhaled the salad (I adore Parmesan cheese) They both seemed to like the steak, but I think they really loved the ribs and baked potato (even the sour cream on it). We all needed a wheel barrow to get us out we were so full. You know after dining on mostly western food while in Beijing I really didn't feel so good. It was certainly nice to get back to Jinzhou and eat rice and vegetables.